SEB type | Products Lineup | Products | NIPPON BEARING CO., LTD. 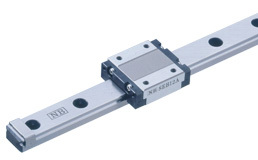 The NB SLIDE GUIDE SEB type is a linear motion bearing in which the ball elements roll along two raceway grooves. This is the smallest and lightest slide guide series offered by Nippon Bearing. The compact design allows for the size and weight of machinery and other equipment to be reduced. The SEB type SLIDE GUIDE consists of a rail with precisely machined raceway grooves and a block assembly consisting of the main body, return caps and ball elements. Because of the ball retainers, the SEBS-B type is able to be removed from the guide rail, simplifying its installation and resulting in lower assembly costs. By using stainless steel for the return caps, the SEBS-BM type is made of all stainless steel components, making it the ideal choice for special environments such as high temperature, clean room, or vacuum applications. A wide block (WB/WA) type, a long block (BY/AY) type, and a wide/long block (WBY/WAY) type are moment resistant slide guide types. The most suitable type can be selected for any demanding operating condition. For the SEB rails, counterbore (standard) and optional tapped hole (N) types are available enabling various installation methods. SEB type has a 2-row, 4-point contact structure. This structure minimizes the installation height, which contributes to light-weight and miniaturization of machinery and equipment. AD profile dissipates guide block deformation caused by installation. ※The SEB(S) type slide guides are categorized according to their block shape and the rail installation method.